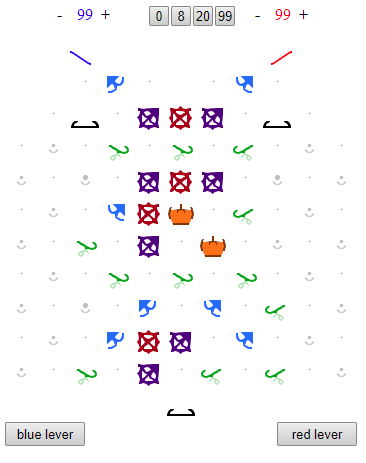 One thing that I always wanted to do with Turing Tumble since I got it was to make a fun, strategic two-player game. Below is an image of the board. On your turn, you may forfeit by setting the toggle by your respective store towards the interceptor. If you forfeit your turn, you must play a ball next turn. Side note: if you plan to play a ball, make sure the toggle is pointed in the right way. But, it’s some trouble to play. Can I press right side lever? Or can I change some bits? Alice: press right-side lever. ball falled, and release next red ball. I should clarify. You can change the two toggles on the topmost edge of the board. This determines whether or not you play a ball, or forfeit your turn. If you forfeit your turn, you must play a ball on your next turn. And you don’t choose a lever. You get a lever, and can choose to forfeit, although your way does make sense. Maybe I should change the rules. Hmm.